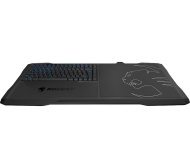 alaTest heeft 16 reviews verzameld en geanalyseerd voor Roccat Sova Gaming Lapboard. De gemiddelde beoordeling voor dit product is 4.5/5, vergeleken met een gemiddelde beoordeling van 4.2/5 voor andere producten in dezelfde categorie. Reviewers waarderen de afwerking zeer maar hebben twijfels over het gebruiksgemak. I have had this for a week now and the keyboard is great, the weight is not a problem. However the mouse pad is slippery and could do with a way of stopping the mouse from sliding around so much. well designed, loads of mouse pad space. Compatible with other branded mouse and headset. Almost PERFECT for lounge gaming. Absolutely love this thing and it is the best option out there. Mouse area is super slippy. It's a great surface if it was always flat but a slight angle on your knees can cause your mouse to leg it. Standing up with it and trying to keep it straight, your mouse is definitely going walkies. No wrist support; bought one separately. No big deal. War ein Geschenk an meinen Freund. Er zockt sehr gern damit, und meint es ist eine super Tastatur. Es liegt bequem auf dem Schoß , Man kann auf der Couch oder im Bett zocken , Beleuchtete Tastatur , Wirkt stabil , Nette Optik , Mousepad inkl. Kann nix negatives sagen. Man bekommt, was man von Roccat erwartet, ein wirklich gutes Produkt. Leider hat die Tastatur kein Bluethooth, wie in der Mediamarktbeschreibung steht.